YOGYAKARTA – Centre for Korean Studies of UGM in cooperation with Korea Foundation host a workshop for highschool/vocational school teachers from 24-27 June 2013. It is expected that the event would increase their knowledge about Korea and they can disseminate it to their students. “We wanted to introduce aspects of Korea to teachers,” said Yuda Heru Fibrianto, drh., MP, Ph.D., Head of the Centr said on Tuesday (25/6). 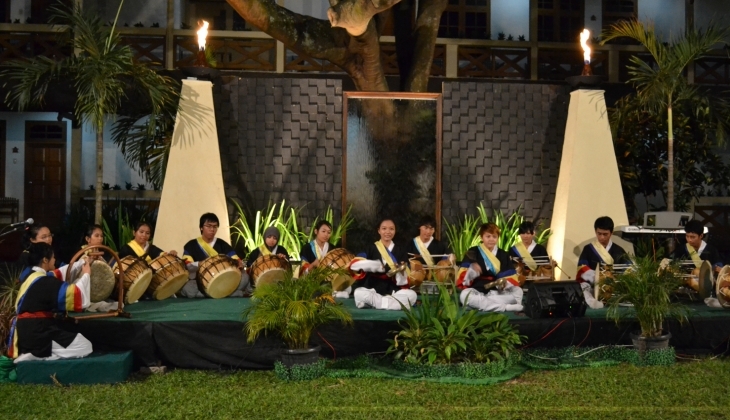 Some forms of Korean culture are introduced in the event, including Hansamchum (Petals dance),B uchechum (Fan dance), Thalchum (Mask dance), Seungmu (Buddhist Shaman dance), modern dance, Samulnori traditional music , songs and Taekwondo. Others are language, history, economy, socio-political and technology presententations, given by some UGM lecturers who had studied in Korea. Yudha added this introduction was expected to be transferred to students by event participants who hail from Sumatera, Sulawesi, Kalimantan, Java, Bali, Maluku and Papua. It would enhance bilateral cooperation between Korea and Indonesia while Indonesians may learn from Korea about their hard working ethics.